To prepare your puppy to be handled, restrained, groomed, and vaccinated throughout its life. Your pup, some yummy treats, and some time. Ask any veterinarian or groomer what they dislike most about their profession, and they are likely to say, “Handling uncooperative or aggressive dogs!” In many cases, the aggression that veterinarians and groomers deal with could be avoided if we taught our dogs, from a very early age, to put up with the discomfort that often accompanies visits to the doctor and the groomer. We can accomplish this by “desensitizing” our puppies to many of the typical procedures they will encounter through life. Between the ages of seven and sixteen weeks of age, your puppy goes through an important developmental stage. This is the time when puppies learn (whether we teach them or not!) which things in life are good and which are not. This developmental stage used to be called a “fear period” by many behaviorists because this is the period when many animals develop lifelong fears. Now commonly referred to as a critical socialization or developmental stage, this is a rare window of opportunity for us to teach puppies to become confident, psychologically healthy dogs. Unfortunately, this is the exact same time period during which puppies receive their first examination and vaccinations from your veterinarian. Many puppies learn to be afraid of the veterinary office and staff during this time, and some puppies actually will learn to growl and/or bite during subsequent visits. It is very important, then, to take some basic steps to help your puppy avoid such negative, lasting impressions. Your puppy will be happier, and so will your veterinarian and his/her staff! Our Handling and Grooming page provides specific instructions for teaching your puppy these valuable lessons. This section addresses how to prepare for your puppy’s first veterinary visit, which unfortunately, must take place during one of the puppy’s most sensitive developmental stages. There are three things you can do to help prepare for your pup’s first visit to the veterinarian. Call your veterinarian and ask for an appointment at the quietest time of day. Tell the staff that you want your puppy to have a good experience, and ask if there is time on the schedule for a few extra minutes that may be needed so that the puppy isn’t stressed by having people moving too quickly. Be willing to pay for extra time, if necessary. ask the staff if you can come by a couple of times before the appointment and just let staff members pet and give treats to your pup. Make those first experiences positive and upbeat. See Preventing Behavior Problems page for specific exercises to practice before going to the veterinarian for an examination or vaccinations. Sometimes, you simply don’t have the opportunity to adequately prepare (as outlined above) for your pup’s first visit. In that case, follow the instructions below. Many dogs experience considerable anxiety and fear while at the veterinary clinic. These dogs may show aggression, escape attempts, or severe fear reactions. Dogs with these reactions are more difficult to handle, and, subsequently, are often subjected to heavy restraint techniques to allow the staff to accomplish the required procedures. Over time, these behaviors typically worsen as the dog has repeatedly more unpleasant experiences. This situation places the animal, the owner, and the staff at risk for harm, particularly if the dog is showing aggression. In addition, the dog may receive suboptimal medical care due to his or her inability to be examined and handled safely. Most of these behaviors can be modified with a well-planned desensitization program. Depending on the level of the dog’s anxiety, the program can be started at various points. Most dogs begin showing anxiety before actually entering the clinic. This may occur in the parking lot or as early as when the dog is put in the car at home, especially if his or her only car rides culminate in veterinary visits. For such dogs, the desensitization process should begin with the car, not the vet clinic. Once the dog is comfortable riding in the car, the following program can be implemented. During the program, your behavior toward the dog will be important in aiding the dog’s success. At no time should you try to punish or comfort the dog if he or she shows anxiety, fear, or aggression. If the dog reacts in any of these ways, calmly abort that trial. Resume the program at a previously successful level and remain there until the dog is completely comfortable. Progress to the next phase only when the dog is comfortable (not showing any anxiety or stress) at the current step. During the modification program, the dog ideally should not undergo any routine veterinary attention. Vaccination schedules may need to be altered to allow the dog to complete the entire program before being subjected to “the real thing.” Discuss these options with your veterinarian. Step 1 – Take the dog to the parking lot of the veterinary clinic. During the first several trials, and depending on the dog’s anxiety level, you may only be able to drive through the lot without stopping. Alternatively, you can park the car but remain inside. Play with or food-reward the dog in the car for a period of time and then drive home. Step 2 – Drive to the parking lot, and take the dog out of the car. Walk the dog around the lot and play with or food-reward the dog during this time. When the dog seems relaxed (and not concerned about entering the clinic), take the dog home. Step 3 – Repeat Step 2, but play with or food-reward the dog on the front porch of the clinic near the entrance. Remember to not progress to subsequent steps until the dog is very comfortable with the step at which you are currently working. Step 4 – Take the dog into the waiting room and repeat the reward steps described above. Over consecutive trials, have the veterinary staff also play with or food-reward the dog while in the waiting room. During each session, these periods of play and/or food reward should be alternated with short periods where the dog is asked to sit or lie quietly. This helps teach the dog to be calm and more closely mimics some of the usual waiting process. Step 5 – Repeat Step 4 in the examination room. Do not progress to Step 6 until the dog is comfortable waiting in the exam room and having both the technical staff and the professional staff (i.e., veterinarian) repeatedly enter and interact with the dog (playing, petting, etc.). The staff should periodically assume postures and positions near the dog that are routinely observed during physical examination and restraint, although no such procedures should actually be done to the dog at this stage. Small dogs who are normally handled on the table should undergo an additional step where the counterconditioning process occurs on the table. During the above steps, you should begin handling exercises at home. This involves conditioning the dog to being handled and manipulated. Handle and gently restrain the dog’s body, head, legs, and feet. In addition, you should begin gently rolling the skin on the dog’s neck, back, and sides between your fingers. Progressively apply slightly more pressure (e.g., mild pinching) as you do this. Always reward the dog during these sessions if he or she remains cooperative. Remain calm, and do not lose patience with the dog. This should become a game associated with fun things (e.g., food, play, and attention from you). Step 6 – This step should be discussed with your veterinarian to solicit his/her personal approach. These are my personal recommendations as a practicing veterinarian and may or may not be the same steps taken by your veterinarian. 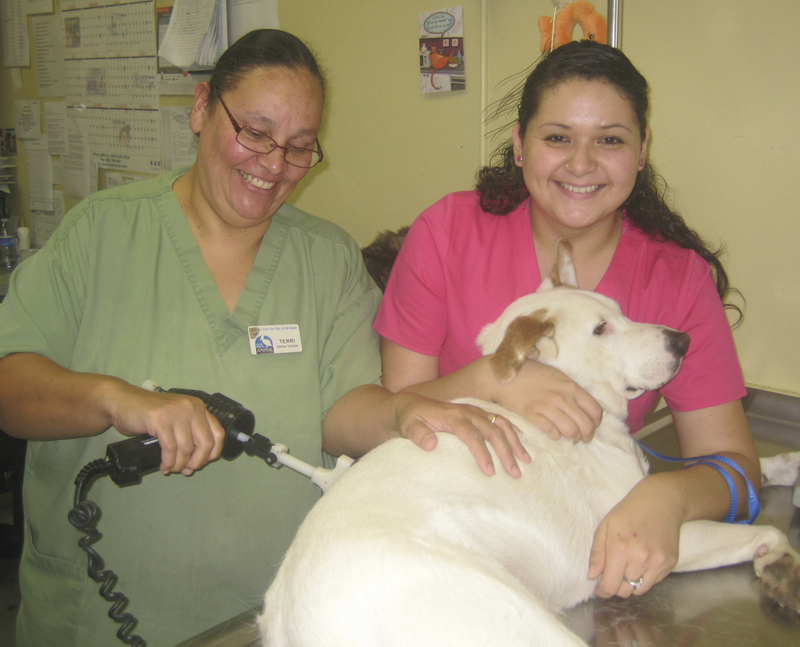 Ask the veterinarian to begin a partial physical exam. This should not start with the dog’s head, as many dogs find this phase intimidating. It is typically easiest to begin with chest auscultation. Distract and reward the dog with food or a toy during this process, even if the dog does not stand completely still. The goal at this point is not to actually do the exam, but to accustom the dog to the procedure in small increments to aid the dog in overcoming anxiety. During subsequent sessions, progress through the process in a more thorough manner. The staff should repeat the same handling exercises that you have been doing at home. Make this fun! When your dog’s vaccinations are due, have only one injection given the first time. If the dog requires more than one vaccine, schedule another appointment (one to two weeks later) for the remainder. You may have to schedule a separate appointment for each injection. During the dog’s first few “real” veterinary visits, it is important to maintain a fun, relaxed atmosphere and avoid overtaxing the dog’s tolerance level. Over time, practice doing slightly more aversive procedures with the dog, using food rewards or toys to distract the dog during the procedure. Step 7 – Once your dog has become comfortable with the above steps, it will be necessary to take the dog to the clinic for fun visits periodically throughout the year. For example, drop by the clinic and, if there is a scale in the waiting room, simply weigh your dog, feed him/her some treats, and go home. Many dogs will revert to their fearful behavior if they resume going to the vet only once or twice a year for procedures. The more frequently you and your dog are able to visit the clinic and staff, the more comfortable your dog will remain when being handled there.